"We can revegetate the entire planet in fifteen years while producing more food, fuel, medicine and fibre per acre"
Of all the people out there practising sustainable, regenerative land use, Mark Shepard is right up there as one of my all time favourites. He terms what he does 'restoration agriculture', and he and his property New Forest Farm are (in my view) one of the best examples out there of what sustainable agriculture actually looks like. I really enjoy his no-nonsense, practical-yet-passionate approach to applying ecological principles to commercially viable agriculture at scale. Speaking with decades of experience actually doing this stuff on the land and making it work, he can be both challenging and inspiring - which I personally enjoy in equal measure. 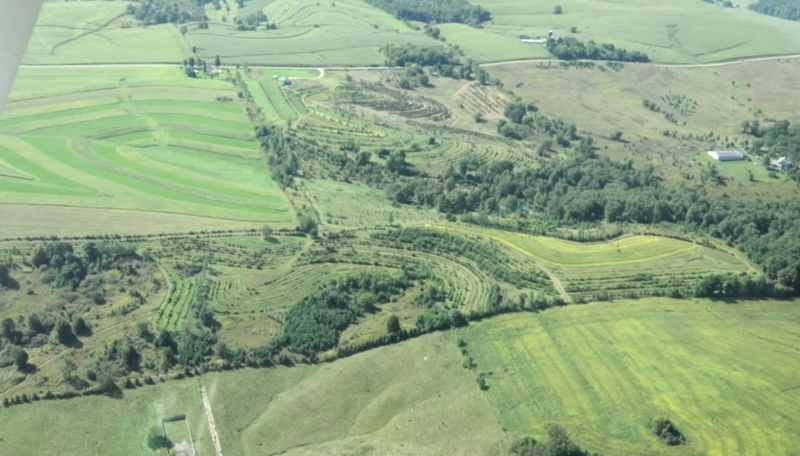 "We need natural ecosystems that are performing effortlessly with minimal inputs. Let's re-design our agriculture after natural systems, (based on growing) plants that work"
While he doesn't go into it in the video below, I really like Mark's general attitude to growing things which is that he has no time or patience for any plant that doesn't do well. If it requires any 'mollycoddling' or special treatment he's not interested. If it dies, he says "good riddance", and he is all the time actively breeding and selecting cultivars of his productive plants/trees that are perfectly adapted to his particular microclimate and biome - selecting for precocious fruiting, flavour, disease resistance and vigorous growth among other things. He calls his 'patented management technique' STUN", which stands for sheer total utter neglect. Apparently his wife suggested that he change that to 'strategic' total utter neglect because he does in fact set things up in a very intelligent and thought out way - nothing is thoughtlessly done. Once planted and set up however, he lets nature do the rest and just selects the best. So being someone that has a lot of time for Mark Shepard's approach, I wanted to share with you a bit about Restoration Agriculture, give you an opportunity to hear Mark speak and also highlight a few key points that I think are important to understanding what makes his approach (and sustainable/regenerative agriculture more generally) distinct and so important. So take a look at this (relatively short - 30min) talk of his below. What I really like about Mark and his approach is that (among other things) he really gets that we cannot continue to farm for the next 60 years the way we did over the last 60 (it just simply won't be possible), but neither can we all throw in the towel, abandon agriculture, live in yurts, eat only from our gardens and sit around a sharing circle holding hands and visualising a better world into existence by turning our backs on 'conventional' society and being 'alternative' - because as positive and well intentioned as many of those lifestyle choices are (and all power to them), it will never appeal to more than a small section of society and so (by itself) will never be enough to fix the problems we face. We need broad scale agriculture to feed everyone, and we need to start right now. Of course we all must do what we can, we should all garden, we must all try to produce something, at any scale - but above all, those of us that manage land on the broader acreages - the farm scale - need to start changing the way we think about what we do. Change the approach so that we stop thinking about ourselves as simply a 'dairy farmer' or a 'beef farmer' or a kiwifruit or avocado orchardist, and instead start thinking of ourselves as "ecosystem managers". When we do this, when our mentality changes, we begin to see the potential to turn our farms - at commercials scale - towards producing significantly more diverse and valuable crops, which in turn improves the health and resiliency of our livelihoods and land, while building and supporting more resilient food systems - which is something that the evidence suggests we are in increasing need of in future. "This spot here produces more than ten different perennial crops, 30% more calories per acre than an acre of corn. Nutrition per acre? Corn can't even come close"
When Mark started New Forest Farm he had bare fields that had been used to produce corn monocultures, but after applying smart design to the establishment of his farm (using Permaculture and Keyline methodologies), you can see 15 years on that it looks radically different to the surrounding properties who persist with their high input monocultures with resulting erosion, nutrient runoff and all those problems we are too familiar with. So what did Mark do differently? What were the design approaches he adopted? "Permaculture (PERMAnent agriCULTURE) is an ecological design methodology whereby we create relationships between materials, plants, animals and humans, so that their function and yield are optimised. The aim is to create systems that are ecologically sound and economically profitable, which provide for their own needs, do not exploit or pollute and are therefore sustainable in the long term" - Bill Mollison, Permaculture founder. "Keyline design is a technique for maximising beneficial use of water resources of a piece of land. The Keyline refers to a specific topographic feature linked to water flow. Beyond that however, Keyline can be seen as a collection of design principles, techniques and systems for development of rural and urban landscapes." 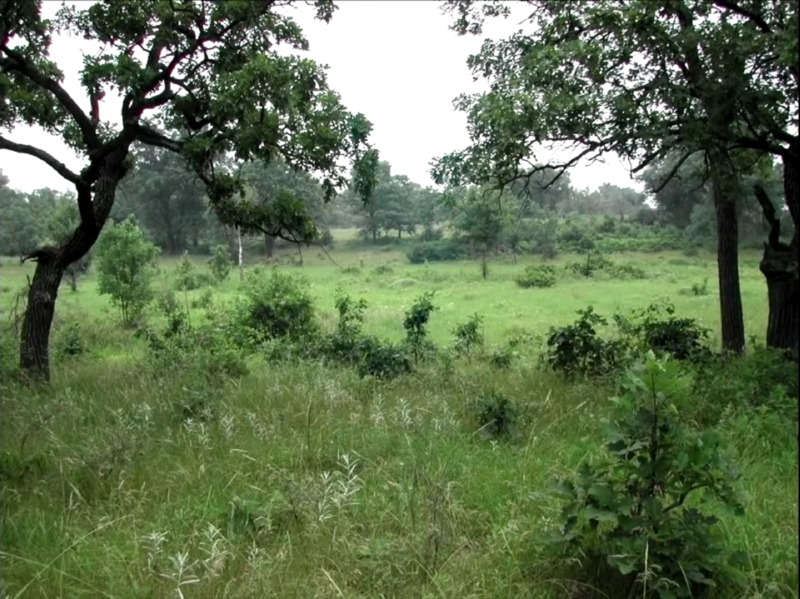 "All of the answers to all of our ecological, fertility, pest and disease control problems have been answered already in these natural systems"
An interesting fact about these systems is that no matter where you look, savannahs are the systems that produce the most mammal biomass of any biome in the world. These ecosystems were in fact the primary place that large herbivores evolved and so the suitability of these ecosystems for raising healthy livestock could hardly come with better supporting evidence. New Forest Farm (110-acres), in the Driftless region of southwest Wisconsin, is a planned conversion of a conventional grain operation into a commercial-scale, perennial agricultural ecosystem using oak savanna, successional brushland and Eastern woodlands as the ecological models. Trees, shrubs, vines, canes, perennial plants and fungi are planted in association with one another to produce food (for humans and animals), fuel, medicine, and beauty. Hazelnuts, chestnuts, apples, and various fruits and nuts are the primary woody crops. Livestock are managed in an integrated manner with the tree crops, where they provide weed control and fertiliser for the woody crops and the woody crop provide shade and wind protection for the livestock. The farm is entirely solar and wind powered and farm equipment is powered with locally produced biofuels that are not taken from the human food chain. The ability to 'stack function' like this - to have different living organisms occupying the same space in a complimentary way - may appear dizzying at first when you list it out like I just did, but the beauty of these systems is that because they are mimicking natural ecologies, these elements all co-exist perfectly happily. In fact more than just co-existing, they actively support each other and are actively important in each other's continuing health and productivity, and (somewhat counterintuitively maybe) makes itself easier to manage in many ways than running any one of those activities in a monoculture by itself. In addition to the extra yield however, you are also improving soil health, water retention, soil carbon, wildlife habitat - while simultaneously reducing input, weed/pest control, runoff and tillage costs (which are only going to increase over time in so called 'conventional' monoculture systems). The fact that restoration agriculture (or whatever you want to call it) offers us a way to not only continue producing food, but increase yield over time while also reducing costs and bringing us all these environmental benefits should be a wake up call to a lot of people - but a welcome one, as who doesn't want to improve the health of their land while reducing their input costs? While running a diverse perennial polyculture enterprise may seem foreign or daunting at first, the great news is that proven, economically viable pathways to developing these systems are out there. They exist, they work right now and there are several approaches and techniques (like agroforestry, silvopasture and alley / pasture cropping) that can help us transition from bare field farming (whether that be pasture based or annual cash crops) to diverse and stable perennial polycultural systems - with all the benefits that come with them. As Mark points out "if we are starting with bare black dirt corn fields, we have to start somewhere, and Agroforestry is the place to get started to move us towards this". 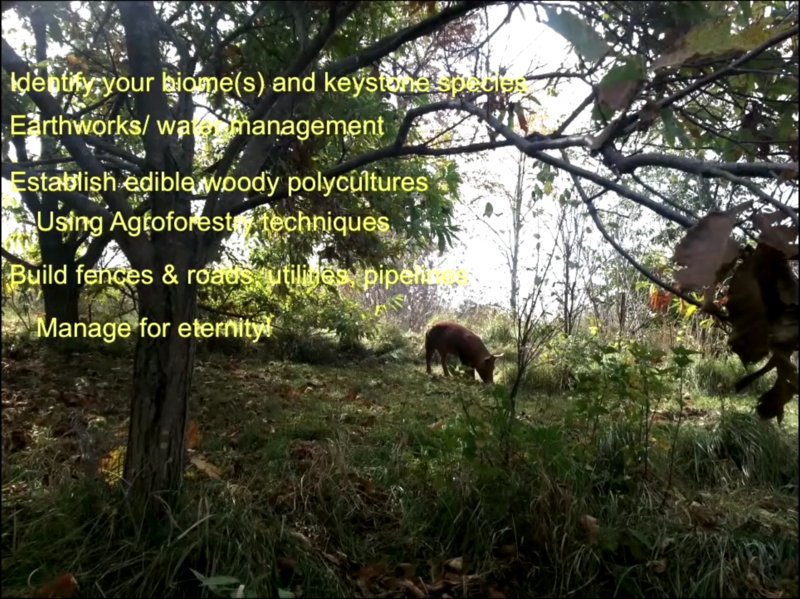 Because when applying these agroforestry practices through transition you don't lose yields, and over time as these long-term, diverse tree systems mature you only increase yields. "Agroforestry is almost the bridge technology that the human race needs to get from where we are today to a future, if we actually have one"
I for one find it an exciting challenge, and I'm ready and willing to help anyone who wants to join the future of food production get up and running. If you want to find out more about Mark Shepard here, or get a hold of his book here or here depending on your region.